An exhibit provided in the complaint that shows PicsArt's Gold subscription platform, which is where VSCO alleges its reverse engineered filters ended up. Visual Supply Company, more commonly referred to as VSCO, has filed a lawsuit against the creators of PicsArt, a photo editing application, claiming the company reverse engineered a number of its photo filters found in its mobile application. VSCO says it attempted to remedy the situation out of court with a letter, sent to PicsArt in February 2019, demanding the company remove the reverse engineered presets from its app, provide accounting records for all profits and revenue made from the presets and identify all of the PicsArt employees who had opened an account with VSCO. 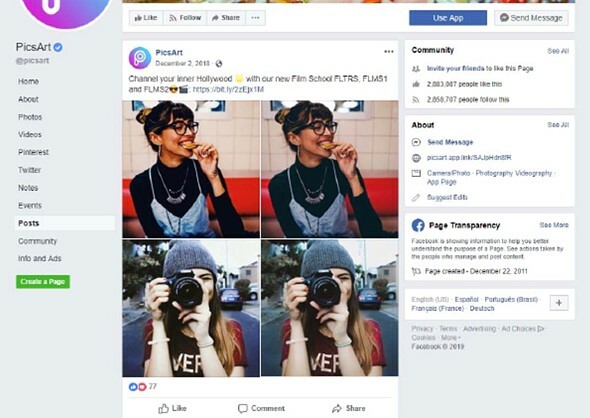 PicsArt subsequently said it would remove all of the filters by March 22, 2019, but as of the complaint's filing date, only 17 had been removed and two new filters PicsArt is publicizing appear to be reverse engineered as well. An exhibit in the complaint that details a social media post that shows a pair of filters that VSCO claims PicsArt reverse engineered to sell as part of its own subscription service. Reverse engineering is a time honored tradition in silicon valley. Wait a minute, wait a minute. Haven't we seen new computational algorithms that change a photos overall look to a TARGET look; just the same? And with good success. So now; are bots violating the VSCO law? Oh and if they try to say no it's for our more creative and weird (off) looks; because that was our weird max look then TOUGH! If that is a popular look you can't say I can't go out and download a free plug-in that gives me that EXACT look with a push of one button; if that's what I want or need. I don't care how artsy f artsy Peggy-Sue design artist was; in creating a "FILTER". People get a clue. Not everything is stealing. Ideas can't be owned. And not all work on an idea is a protected work! I expect some flack from paid photographers who play the paid works game; but you are all kidding yourself. It's a sad game. Another way of getting photographers paid; is the future. Find that way now. The term 'filter' for those programmes is rubbish. A 'filter' in the optical sense blocks certain light frequencies or lets them pass with priority (high- or low pass, broad or narrow). A programme or algorithm called 'filter' here is a piece of colour faker and in the surroundings of photographical meaning no filter at all. You could call it a 'changer' -may be. PicsArt has opened the PicsArt AI Lab in Moscow. The Lab will enable the company to further its leadership in AI and Machine Learning. The new AI Lab team will work on enhancements of PicsArt’s existing AI-based features such as visual transformation, segmentation and classification of images, user behavior prediction and content recommendation. “PicsArt is a fun, lightweight app that millions of people use every day. We have to invest in the serious tech behind it,” said Hovhannes Avoyan, PicsArt CEO and co-founder. Founded by entrepreneur Hovhannes Avoyan, PicsArt is backed by Sequoia Capital and is headquartered in San Francisco, with offices in Los Angeles, Beijing and Yerevan, Armenia. Mmm, lots of proprietary film renderings as well as camera color profiles and camera jpeg filters get reverse engineered by companies such as Adobe, and I daresay by VSCO itself. In addition to being amateur photographers, it appears a lot of us are also amateur legal scholars. I thoroughly resent your use of the word "amateur." I am in fact a highly skilled, non-commercial professional. Looks like PicArts doesn't have standing if they essentially admitted to this reverse engineering and end up replacing the filters with other reverse engineered ones. Their responses to the accusations not only amount to an admission of guilt, it's also a clear indication that they've built a good bit of their processes around reverse engineering! You really really have to understand that reverse engineering is not illegal. Maybe not, but duplicating copyrighted work is illegal, and so is the act of defeating access controls and technical protection measures. No one commenting here knows how those issues will play out in this suit. Depends on so many things. For example - how did they implement it? If I had to do it I would take a set of images and a convolutional neural network and let it train. You get your own unique implementation (as the starting point is a set of random numbers) plus this works well enough for so many things. Or use generative adversarial network. Or something else. This is such a simple transformation - there are sooo many ways to make it look similar. Though, to be honest - I don't see the appeal in making your product work exactly like some other - why would anyone bother with you product? for me its harder coming up with names for the filters "summer, chocolate spray, ..." , see i couldnt keep going, my mind locked up. I have no sympathy for either company. Both corral users into Adobe-style subscriptions, so I hope they sue each other into bankruptcy. Go to Apple's App Store and sort by all of the one star reviews. Apple should definitely indicate "Subscription" when that is the case, not "In-App Purchases." Who would have thought VSCO has color scientists? I know, right? I was assuming their main area of expertise was in petroleum engineering. I do so hope their colour scientists can show a court their pertinent qualifications. @Wye - not sure that's really going to come up. Whatever their qualifications, Picsart already agreed that they violated the Agreement. @stevo23, you are probably right. Most VSCO users have violated the eula anyway and it will be interesting to see how the case develops. @WYE - that's an interesting point. I suppose there are many many more violations, but this one is the big bear they're after. @stevi23, I think you hit the proverbial nail on the head. VSCO had better hope big bear doesn't bite back. @Wye - I don't know who has the better case. Seems like it's strong for VSCO, but I've seen stranger cases. Anyway, using film filters is for hipsters with bad taste and a bad sense of esthetics. Encouraging it is an offense and the Association of Good Taste Photographers should sue VSCO. I guess Kodak, AGFA, Fujifilm trademark owners should also sue VSCO. "The VSCO app which state users 'agree not to sell, license, rent, modify, distribute, copy, reproduce, transmit, publicly display, publicly perform, publish, adapt, edit or create derivative works from any VSCO Content." So, creating an image in VSCO then, for example, posting to FB or insta violates the users agreement. Why hasn't VSCO sued them, or taken action against such perfidious violators? The confusion arises from your interpretation of 'VSCO content'. I'm not a lawyer, but clearly it refers to their proprietary code, not to the use of their filters by an end user. I am not confused and you are not a lawyer. Having briefly read the complaint it seems that no code (i.e. the language in which programmes are written) violation is in question and the main complaint of the plaintiff is outlined in the second paragraph reproduced here for your convenience. @Wye: just trying to explain why using the filters and posting to FB might not be in violation of TOCs. I hope we're both agreed that it's an unlikely proposition, in which case 'VSCO content' must refer, if not to VCSO's code, then at least to their IP. For example, the LUTs which define their filters. LOL, I love the way most of the commenters here have an analogy proving the suit is BS. The fact that none of the analogies have anything to do with the issue at hand doesn't seem to matter. @filmluvr - what is the issue at hand in your estimation? The company is clearly complaining about theft of its code through reverse engineering. There may also be issues relating to the violation of end user agreements and circumvention of protective measures that violate the Digital Millenium Copyright Act. Analogies aren't applicable to any of this, just the specifics of the case that (apparently) no one here actually knows. Reverse engineering is, in fact, the opposite of code theft. @filmluvr - did you read the brief? Sounds like you might have. I think it's pretty clear that it isn't so much the reverse engineering they're complaining about but the violation of the (click through?) agreement. It just so happens that they probably reverse engineered it, but it could have been any method. I think the difficulty is proving that it's humanly impossible to achieve the numbers they did without access to the code. It's a large presumption to me, but maybe it makes sense. And some here claim that reverse engineering is a get out of jail free activity which it is not. There are some specific situations where it is allowed and this doesn't appear to be one of them. @DrewRick - it's one method for code theft actually and our laws only allow it in certain circumstances. It's not a cart blanche absolution. There have been many companies sued and put out of business because of their reverse engineering of code. Ah, there seems to be a problem of wording here. Turns out "reverse engineering"is used to refer to the practice of decompiling code and using that to create another version that recreates the same functionality. What I meant, and what the evidence points to here, is a so-called "clean room re-implementation" looking only at the inputs and outputs, where case law is much less clear cut and which in some case is explicitly allowed. For example, there are many programs that look and feel like Microsoft Word, which itself is a functional clone of preceding software with similar functionality, and this is perfectly legal. @DrewRick - got it. But still, even menu look and feel and functionality can be patented. So not perfectly legal as the lawsuit leveled by CreativeLabs against Apple shows. But in this case, they're saying that the results are too perfect to have been done any other way than your first definition. Did you read the brief? Just another money grab by a company that doesn't understand that there is NOTHING unique in their "filters" and that anyone with a copy of photoshop can reproduce them, if so needed. Well apparently there is something unique, as they've managed to prove that it's been reverse engineered. Read the article. Reverse engineering is not illegal. They have standing in ToS violation if they can prove it (they probably can), but I doubt any damages related to breaking of the ToS of an app will amount to much. If they "stole" their algorithm - still not illegal. That's what patents are for and this is not patent related. @lylejk - read the filing and you'll realize that it's not in question that PicArts reverse engineered or copied VSCO's products. @otto - read the filing. they admitted to copying very clearly. Reimplementing an algorithm is not illegal. 1. Patents - where you describe the process and are granted monopoly for a duration of time in exchange for your description so that anyone can use it after it expires. 2. Copyright - where you are protected from copying of your verbatim (here) code in full or in significant amount. 3. Trade secret - which protects you from your own workers once they leave for competition. This case is none of these. You can reverse engineer any program and reimplement it freely unless you are copying existing code/data or violating patents. @otto - again, they clearly admitted guilt when they agreed to take down offending filters and yet didn't take them all down. They also agreed to VSCO's method for determining their guilt and then showed that they plan to keep it up with some of the replacement filters. Case seems strong for VSCO. And again, while this is all about publicity, there is nothing illegal in reverse engineering. I don't give a *** about either of these companies, but I do care about your rights and you are free to reimplement non patent encumbered products unless the Congress says otherwise (which they have on occasion). "In fact, PicsArt reverse engineered popular filters from the VSCO app in violation of the Agreement and falsely promoted them to consumers as its own"
So the case doesn't hinge on the reverse engineering, it hinges on the violation of their Agreement, the reverse engineering merely being the means by which they violated. In this case, apparently they feel there is something being violated or the attorneys wouldn't take the case. And apparently Picsart realizes they were acting illegally or they wouldn't have attempted compliance. And the real complaint is that PicsArt said they would comply and attempted some compliance but fell short. They're condemning themselves really. Assuming is dangerous, I teach computer engineering at university. Have a nice day. @otto - you're the one assuming my friend. teaching computer engineering and having a Legal mind aren't the same thing. Read the brief. Unless you can only read code. Which is understandable. while i love and use vsco, copying and reverse engineering happens in all forms of businesses. its called competition. i would say it is pretty much standard procedure to copy the most influential model which holds majority of the market and use it as a base for your own designs. smartphone, gadgets, food, clothing, architectural designs, delivery services, etc, you name it. you need to see the bigger picture as this is harshness of life and reality as you know it. thats why all businesses have to continue to evolve and innovate. There's a difference between reverse engineering a product (making one which behaves in the same way as that of a competitor but uses original code) and blatant ip theft. @ModelMike it was clearly stated in the article that "reverse engineering" was done and PicsArt copied the look. zero mention of code theft. You know the burden is to prove stealing; not prove you didn't. So case over. It should have been rejected. I should think anyone with a law degree knows that. But see; I'm no lawyer and I bet they do know it and are proceeding for greedy means, anyway. You have to remember; the lawyers get paid either way. People still use that VSCO stuff? LOL. I love it. One of my favorite iOS editing apps. I run most of the keepers from my 1" compact through it, too. 5 minutes! Well you must have an expert opinion, then. I'll defer to you. I wonder how many lawyers are trolling with shill comments and actual judges drinking the Kool aid? Can we get a clue, Alex?! Forums are WACK. So say we all. This is BS. And I'm one to say go hit up Gimp (with LinuxMint) and click to install GMIC (and others) with Gimp for FREE film looks options. As is or editable. Which of course depends on where the photo starts (flat or whatever). Because; these are things a editing person could also do all "manually" (PS or Gimp the harder ways, etc...); that effects known, old characteristics of different film type color/looks. A Green or Magenta skew to name one. Highlight curve wigglin'. Added contrast and more. So A) If they did compare other digital outcomes then so what? And B) there's no way to prove it anyway; because the goals are largely the same. It's art and style. One can't own how Portra 400 looks in digital sims. Else Kodak can sue you for editing your pictures LIKE that. This is just dumb. So; I suspect this is a company strong arm'ing another; whether they win or not. It still cost too much in court even for the WINNER! So our courts and also their common sense is borked. Fix it. I mean; you do get that if they say company A makes a Kodak_Gold look and suspect thief company B also demonstrates a Kodak_Gold look and the similarities are uncanny then SO THE FRACK WHAT? Wasn't that the goal in the first place. A certain look. People. Learn to fish. Come on. It's like suing me for catching a fish that looks like the twin of the one you caught. Fishing was the point; in the first place. Oh and another thing [Besides GET OFF MY LAWN, LOL]; if you think yourself a pro and don't roll you own looks (or change to ANY; for a goal) and fast then you, 'ain't seen the ball since kick off'. Seems like a winnable case for VSCO. Too many coincidences plus the color science experts can really trace similarities when you deconstruct digital files. Recreating a "look" created by filtering an existing image is very dubious copyright. If PicsArt stole the names of VSCO filters while duplicating the functionality, I'd be more impressed with the VSCO case. If the filter names are different then it's pretty much shouting into the wind. Particularly as PicsArt can 1. go out and prove prior art on the VSCO filters, some of which have been copied from existing software 2. slightly modify their filters so that the co-relation is not so close. VSCO goes on my ban list for playing dirty. 'Reverse engineering' is a pretty BS term for creating a LUT. But Hey I'm no patent lawyer. Am I missing something here? I get the idea that it would be 'statistically almost impossible for that to happen without rigging.' But inst that what ML is for? Shove a bunch of publicly available images from Instagram through a ML and spit out a LUT. That's a lot to read through (I guess that's why lawyers make the big bucks)….do they spell out what exactly constitutes a "filter" and why that would be protected intellectual property? Are these simple Lookup Tables for example color(112,234,211) becomes color(145,237,210)? The overall image-level similarity metric appears to be too close to be a mere coincidence. The argument is that it would be statistically almost impossible for that to happen without rigging. A bit like DNA in a murder trial. No wrong. Because one looks don't significantly vary from another film looks does not mean you have a copy case. the point was to arrive at the same place in the first place. This is just dumb and money grubbing. Go work. They were lucky anyone bought these is the first place. Whoever does the technical work at these companies is probably really hoping they saved their old work! @Carp - I don't think you understand what the metric signifies. It rules out your case decisively, or any other superficial "resemblance". The numbers are almost identical. That's virtually impossible. But is it almost impossible? What are the filters aiming to achieve, and is that goal something which is precisely and universally defined? If so, then two competent filter designers should come up with the same filter independently. I’m not suggesting this is the case (it sounds like it isn’t), but just because they’re “identical” doesn’t necessarily mean any theft of intellectual property occurred. The coders will have some explaining and convincing to do though. I bet you that if you gave us both a target and starter photo and you used one of these stupid filters; that I could manually or by faster editable means come to almost exactly the same place. And that is the point. Many times exactly. These darn filters are not witchcraft! Stop wasting your money. You can still apply free filters for speed. Great results will always depend on where you start. And custom is as custom does. @Luke, you can put some variant of a color checker through a filter and come up with a very close approximation of the lookup table used in the original filter. It's not rocket science. For example, various companies (including Adobe I believe) and individuals have reversed engineered Fuji jpeg film filters this way. No theft is necessary. The DNA difference between fraternal twins and identical twins is what would make all the difference in this case. If you think you can prove the defendant's case is predicated on mere similarity, then go ahead -- I'm sure they'll be grateful. No different to stealing software or any work of art IMO. I will never use Picsart as a matter of principle after that. No it is not stealing and you have to think. (Houston we have a problem). What you can't do is SELL others stuff posing it is yours. That has not been proven beyond reasonable doubt here. ...And it can't be. Because the idea is looks no one owns. It's like saying if I use a self tanner then I'm fake (THIEF! ); because others have that exact shade. Just dumb. That was the idea (look) in the first place. It's like the self tanner company suing another because it's the same. Just goes to show; not everything that looks bad is bad. Nor good good! It's a canned effect and the maker of the canned effect is offended someone can make something so close to theirs. They however speculate without proof that rival is reverse engineering their methods because the product similarities are too close and there are too many coincidences. Methinks the judges will favour the plaintiff and make the defendants make their stuff less similar. Grey area as who has the ownership to a colour effect? If I dye a red T shirt, does it mean I own that specific method to dye the T? I don't think any judge would allow that. It's something too simple that anyone can discover. If it's a win, don't think there should be any big payout as it's a niche product. @photoman Indeed, much of our culture is based on copying and derivative works (kind of inevitable to anyone who gives it more than a cursory thought). If the punk rock movement happened today instead of in the 1970s many here would describe it as a criminal conspiracy. But in this case there is Breach of Contract based on the user agreement 'signed' by the PicsArt employees as they created VSCO accounts. BS is as BS does. 1. PicArt (PA) comes out with filters. 2. VSCO (V) sends a letter to PA in Feb, saying, "Stop using our filters, give us an accounting, and disgorge your profits from our filters." 3. PA responds to V, saying, "We agree to remove all the filters you mention and will do so by March 22." 4. PA does, in fact, remove 17 of those filters, but not others. And we are given no information about PA surrendering any profits, so it's fair to assume that this did not happen. 5. When the deadline passes, V files suit. Now, there is A LOT more than nothing that supports V's claim. It's not a slam dunk case, but V will point out, "Why on earth did PA remove any of the filters if it PA was not acknowledging a violation of our intellectual property?" That seems to be a logical and powerful point...why DID PA do this if PA was totally innocent? We will see what happens as discovery continues in this case. "why DID PA do this if PA was totally innocent?" That is a fair response. And it might indeed be the reason. But why remove 17 filters and not all of them, if your motivation is to avoid expensive litigation? I totally get why a company might remove the filters but hold off on disgorging profits. But why remove a bunch of filters but leave other suspected filters active? That's the part that is opaque and mysterious to me. If my goal is to avoid litigation, then I'm gonna remove all those filters. If I think the other side is full of B.S, then I will remove none of them and will take my chances. But removing *some* of them . . .??? If I had been in-house counsel, it's not what I would have suggested doing. VSCO built their company upon emulating films. PicsArt is just emulating VSCO. VSCO is no originator of film looks simulation. VSCO has a huge hurdle to jump over on this one. We will see but I don’t think they have anything. So this isn't just a case of they figured out the slider settings to make images look like ones people can make with our slider settings? those are my slider settings. back off dude! @kreislauf. Ah haa, but did you slide the clarity filter BEFORE you washed out the blacks? I don't know, this is a grey area. Many of us creates our own editing filter, even those may or may not look like vsco. VSCO can't patent the look / tone of an image. Unless PicsArt stole the code for VSCO, I would say they don't have any case. "VSCO determined that those PicsArt filters have a Mean Color Difference (“MCD”) of less than two CIEDE2000 units (in some cases, far less than two units) compared to their VSCO counterparts. An MCD of less than two CIEDE2000 units between filters is imperceptible to the human eye and cannot have been achieved by coincidence or visual or manual approximation"
matching code and stealing code is a very different thing. basically, it's the main point, if they did not patent any form of methodology. this is a desperate attempt to sink the competition. kreislauf - I'm not so sure. If PicsArt copied a "design" and used it for their own commercial gain, then it is, or should be illegal. An analogy might be if Pentax copied the design of a Nikon camera, altered the specification very slightly to make it appear different, and then sold it as a Pentax. Certain Yongnuo lenses copied from Canon spring to mind. It will be interesting to see what the law courts make of it, if PicsArt don't settle out of court. As far as I understand, it is not about patents. I can see two possible claims in the text. 1. They have broken the contract for the user accounts. 2. They have illegally reverse engineered code. Personally I am not sure they will succeed with any of those two, but I am not familiar enough with US law. As far as I know - the only proof VSCO has is that the PixArt filters produce very similar result. And - I assume those are color filters. And one way to achieve very similar result is to make color profiles of the filters and than apply the same color profiles in their own program. Then no reverse engineering of code has been made. I would be very surprised if measuring the color profile for a filter is illegal. Then, if they took all filters and made a number of identical ones, that is kind of devious. And maybe ... then it might be a case. Stealing code is not the only way a near-identical look could have been achieved. Let's say a user inputs several test images (evenly white and evenly each primary color, is what I would probe with, for starters, were I trying to ascertain the filter effects), and measures the output. Do that for various hues, saturations, etc, and you soon have a "map" of the spectral/spatial transformations being done by that filter. Simple challenge-reponse accumulation. The problem is not that PicsArt did that -- as a user I might want to better know what those filters were doing so I could be an informed user and more-predictably use the product. The problem is that they violated the EULA, when they used their probing to engineer a competing product. Roland - "the terms of the VSCO app which state users 'agree not to sell, license, rent, modify, distribute, copy, reproduce, transmit, publicly display, publicly perform, publish, *adapt*, *edit* or *create derivative works* from any VSCO Content." If 17 PicsArt employees created VSCO accounts and then adapted or edited the content, as they certainly appear to have done, then they have broken the contract, and you can be pretty sure it was upon PicsArt's instructions to them to do so. Also, if following the initial complaint by VSCO, PicsArt subsequently "said it would remove all of the filters by March 22, 2019", that is tantamount to an admission of guilt. I don't think PicsArt have got a leg to stand on if this goes to court (assuming that the information obtained by dpr is factual and complete). OK - it seems that breaking the EULA is the only thing they can claim. And evidence number one is the very similar filters and evidence number two is that some employees at PixArt have had accounts. Not proof but rather strong hints at least. OK - I still do not have enough knowledge about US law - so no speculations from me. In most electronic Reverse Engineering, a bunch of people who have NEVER seen or touched the product being reverse engineered, get in a room and OBSERVE the functions of the product, and replicate the functionality. I believe this is OK and accepted. I once emulated someone's conversion process by creating a synthetic picture with a colour ramp in it, and sending that through the conversion. That resulted in a very nice lookup table which could give very similar results to the original conversion process. I didn't steel any code. I may have reversed engineered someone else's data. And if you're reverse engineering something (legally), you need to have a people who has no knowledge of the product observe the product, and create a spec for what it does. You then give that spec to different people who have no knowledge of the product create an implementation of that spec. Reverse engineering and implementing the result by yourself is shaky ground. If they didn't steal why did they agree to remove the filters? What could possibly be grey here? At least getting Picsart through the court will set a good precedent and make those stealing your photos or software think twice. As Roland says, color profiling the filters would achieve the same. Probably, depending on what the filters actually do. Point is, coinciding colors is no proof of stealing code. I guess without further evidence, it will be hard to win the case. falconeyes - Either way, it smacks of cheating. A company too lazy to design something of their own, so they either profile a competitors product, or marginally modify copied code. Prior to this article I'd never heard of either company, but on the "evidence" provided so far, my sympathies go to VSCO. Reverse engineering is NOT illegal. If it was, Sigma and Tamron would not be able to sell AF lenses for Canon or Nikon. Godspeaks - Absolutely true, but there seems to be a fine line between reverse-engineering and copying someone else's design. It's really up to the courts to decide, as they'll have a great deal more information upon which to draw their conclusions than we do. Reverse engineering in order to make spare parts or accessories to the main product is considered fair. That is why you can buy lenses to cameras and spare parts to your car without anyone complaining. I don’t think the situation with 3rd-party lenses is this easy. AFAIK, there is a silent agreement within Japan to not sue b/c of reengineered AF lenses. Which is why you won’t see them from non-Japanese companies like Zeiss or Walimex. Maybe it is not that easy. But the explanations I have heard is both the one you give and the one I mentioned. And ... they are not in any way in conflict. They might actually be the same. Sigma already won a big court decision to reverse engineer for their lenses to work, some time ago against canon/ nikon etc. Nikon sued sigma's OS which is VR and they won that patent lawsuit. Canon must has some cross patent licencing with nikon (they have lost of similar features). You can reverse engineer, unless the design is patent-able. You can't patent sticking 3rd party lenses onto your system nor the color of a filter, so in this case VSCO is going around maybe using the user agreement or if they can prove the source code was stolen.